Have you packed away Easter already? Put away the bunnies and ducklings and baskets? Taken in the flag from your front garden with the buck-toothed Easter Bunny grinning on it? Swapped out wreaths on the front door? Found the last plastic egg overlooked in the weekend hunt in your back yard? I think it’s because Easter is such a holy day to me that I have so few decorations. 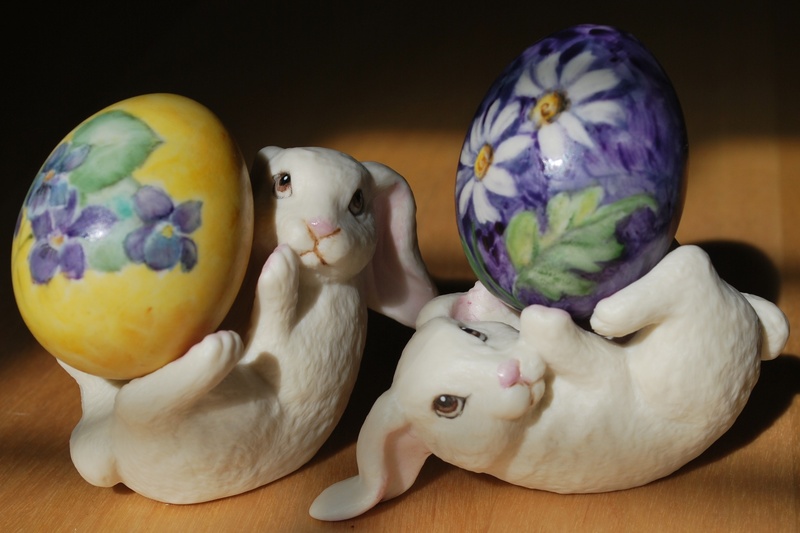 The picture above shows you the sum total of what I pull out at Easter: two small bunnies holding eggs that my mom painted for me years ago. My mom is an extraordinary china painter, and I’m blessed that she took time away from her plates and bowls and other beautiful works of art to paint a full Christmas nativity set, as well as these Easter bunnies and eggs, for me. To be honest, I usually forget to take them out of the closet where I store them (sorry, Mom! ), but this past Sunday, I got them out right after church. You see, my pastor preached a sermon that reminded me I hadn’t put them out and also convinced me to leave my two bunnies and their eggs out longer than usual this year. Mark 16:7 says, “‘But go, tell His disciples and Peter, He is going ahead of you to Galilee; there you will see Him, just as He told you. '” Pastor Ned’s point with his sermon was that we should not be so quick to check Easter off our to-do lists and move on to the next thing on the list. Instead, we should carry Easter with us back to Galilee. For the disciples, Galilee meant home, safety, a place to rest and regroup, and the place the risen Christ would meet them again. They weren’t going back unchanged, nor were they to return to the lives they had before they followed Jesus. No, they were to go back to where Jesus’ ministry had begun – where He had found them originally and would meet them again – so that they could start sharing Jesus’ Easter message. Just as Jesus wanted to remind the disciples that His story was not over then, we are to remember that it’s not over now, either. It’s a story that is “To Be Continued.” And we are to keep proclaiming the story and sharing it with those in our own Galilee. So, perhaps you could take one of your Easter decorations back out of storage and leave it where you can see it for a few more days, reminding you to tell of the Easter story and its blessings, joys, mercy and grace with those around you. Think of keeping Easter a little longer as a gift from God, a clinging to a season that refreshes us throughout the year. And since they need change, the Enemy (being a hedonist at heart) has made change pleasurable to them, just as He has made eating pleasurable. But since He does not wish them to make change, any more than eating, an end in itself, He has balanced the love of change in them by a love of permanence. He has contrived to gratify both tastes together in the very world He has made, by that union of change and permanence which we call Rhythm. He gives them the seasons, each season different yet every year the same, so that spring is always felt as a novelty yet always as the recurrence of an immemorial theme. He gives them in His Church a spiritual year; they change from a fast to a feast, but it is the same feast as before. Might you keep the Easter feast going this year, letting its message carry you through the coming fasts and feasts? And might you share that feast with others starving for a crumb of hope? This entry was posted in flourishing tree and tagged C.S. Lewis, Christmas, church, Easter, Spring by hopesquires. Bookmark the permalink. When Robey was 3, he asked (after dismantling his Easter basket and being prompted to get ready for church), “Is it Easter at church too?” The best response to his question came from my friend Mich who said, “At church, it’s Easter every day, but especially on Easter!” Your post reminded me of that conversation.